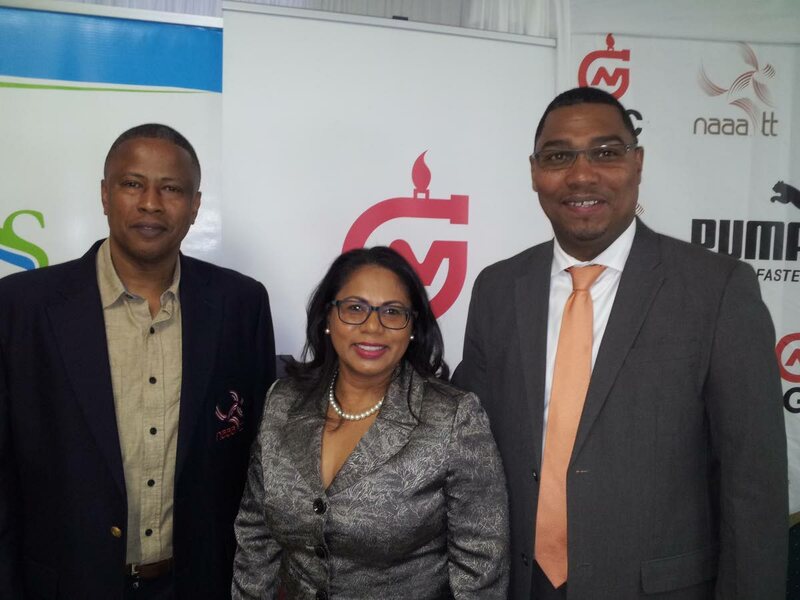 General Secretary of the NAAA, Dexter Voisin, left, poses with Sagicor’s Business Development and Marketing manager Lisa Mahabir, centre, and Ronald Adams, vice-president of Operations at NGC, at the launch of June’s various track and field championships. IN an effort to increase crowd spectatorship and entertainment during the busy month of June, the National Association of Athletics Administrations (NAAA) has joined forces with the newly formed Sport Entertainment Company of TT (SPENTT). The NGC/NAAA Junior Championships will take place on June 9 and 10, followed by the NGC/NAAA Juvenile Championships on June 16 and 17. The month’s activities conclude with the NGC/Sagicor/NAAA Open Championships from June 22 to 24. All the events will take place at the Hasely Crawford Stadium in Mucurapo. The Open Championships will feature the country’s top senior athletes including 2018 Commonwealth Games gold medallists Michelle-Lee Ahye and Jereem Richards. The NAAA said despite the calibre of athletes on show, they are not happy with the size of the crowd. General Secretary of the NAAA, Dexter Voisin, is hoping this will change. Voisin said he does not understand why TT citizens support athletes at international events but not at home. “I know when the Commonwealth Games was in progress in Australia...most of TT had to get up some ungodly hours to view the finals of our events. I don’t see the reason why they can’t come to the Hasely Crawford Stadium to see those same athletes in real time,” he said. Zwede Hewitt, founder of SPENTT, said the company is hoping to make the experience of the meets more enjoyable for spectators. SPENTT will be trying to gather more support for the events in June through sponsor giveaways, artiste performances and crowd participation events. Lisa Mahabir, business development and marketing manager at Sagicor and Ephraim Serrette, president of the NAAA also spoke at the event. Reply to "NAAA look to increase fans for National Championships"